One of my most favorite places in the world are the towns along the Romantische Straße (The Romantic Road) in Germany. The midpoint along the Romantic Road that runs from Würzburg to Fussen is Dinkelsbühl Germany. 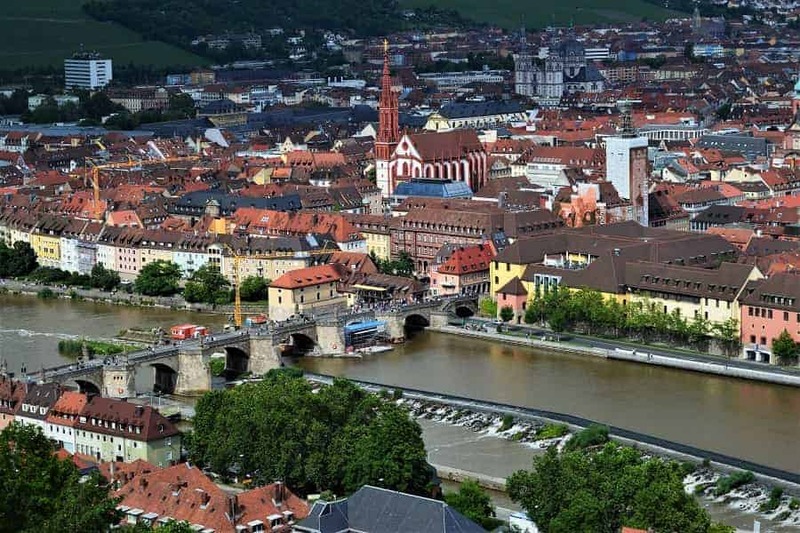 This town is full of Medieval charm (very similar to Rothenberg ob der Tauber) and you will want to take time to fully explore all it has to offer! This Gothic church was built mid 15th century. 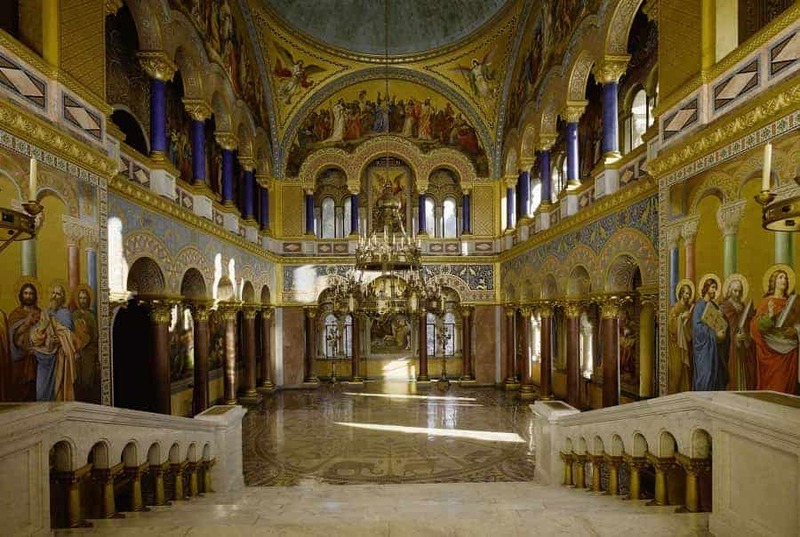 Inside, you will find eleven pairs of columns support a vaulted ceiling with an intricate pattern of stars. 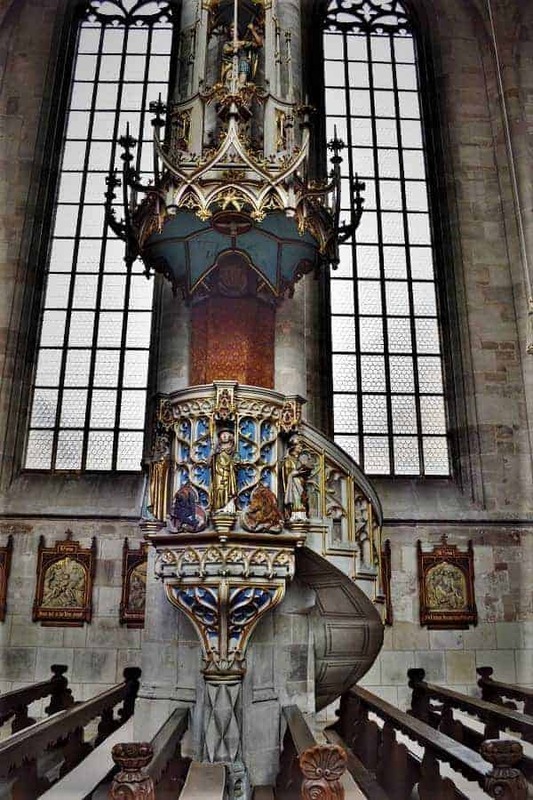 The Minster became popular with pilgrims because of the highly-decorated altars inside the church. 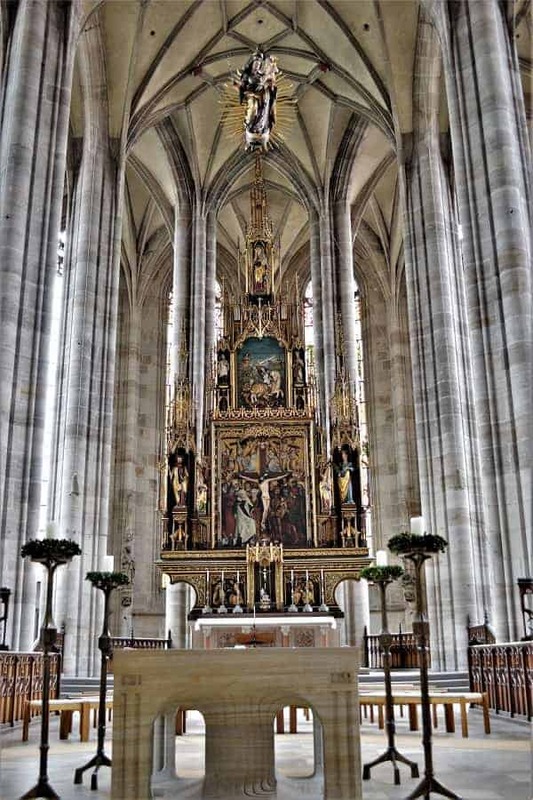 You will find ornately decorated side altars: St. Sebastian’s Altar (around 1520) and Holy Trinity Altar (around 1500). Centrally located are many gabled buildings that date back to the early 17th century. The colorful hotel and restaurants that line the market make this area one of the most photographed along the Romantic road. The Marketplatzis a great place to grab lunch or dinner during your stay. Specialties include sausage, spare ribs, beer and wine. Speaking of Wine, you won’t want to miss the Deutsches Haus. 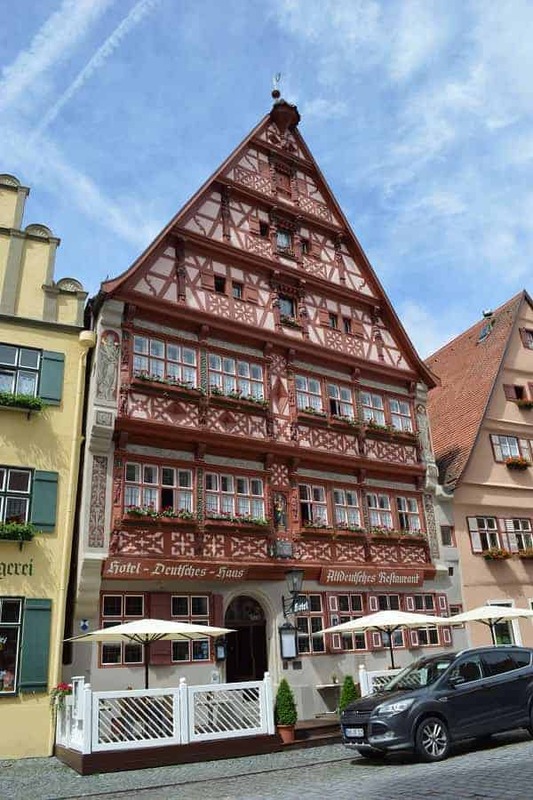 This romantic 15th-century home, now hotel/restaurant, serves up traditional German food. Carved into the side timbers are images of the Roman wine god Bacchus. This is the gate that allowed access to Dinkelsbühl for over 600 years. The walls surrounding really reflect the history of this town and how important the towers and access points were to the townspeople in the Middle Ages. 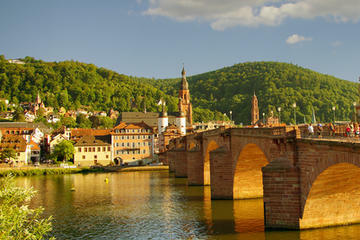 About an hour and one half drive from Dinkelsbühl Germany is Würzburg, a perfect spot for a day trip from Dinkelsbühl. 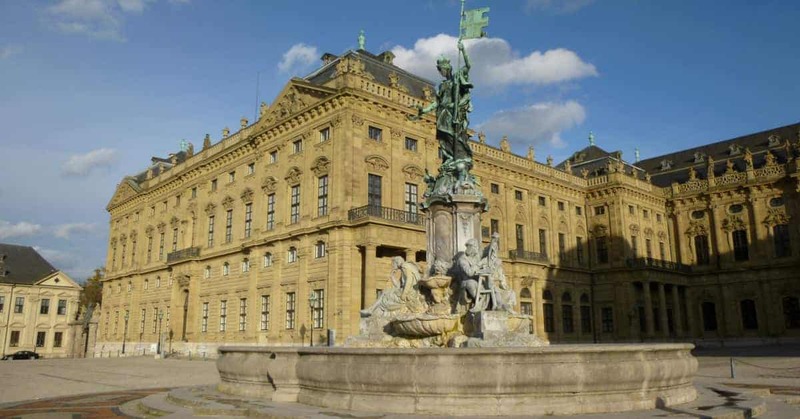 Würzburg is the home to one of the largest and most beautiful Palaces in Germany~Residence Palace. This is one of Europe’s most renowned Baroque castles and is also a UNESCO World Cultural Heritage Site. Würzburg Residence has a total of 40 period rooms that are open to the public and gives guests a glimpse into courtly life in the 18th century. The Fortress Marienberg is the most dominating feature of the city. 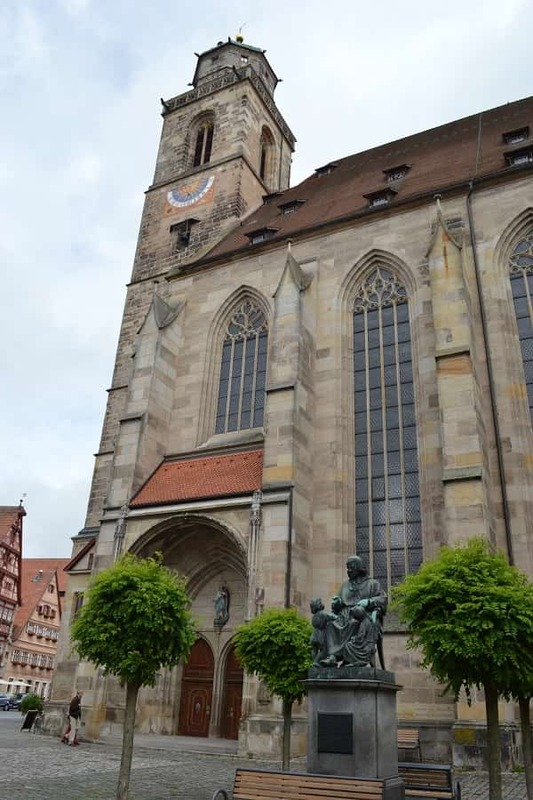 In 704 AD, the first Würzburg church was built on this site (St. Mary’s) and in the 13th century the fortifications were added. 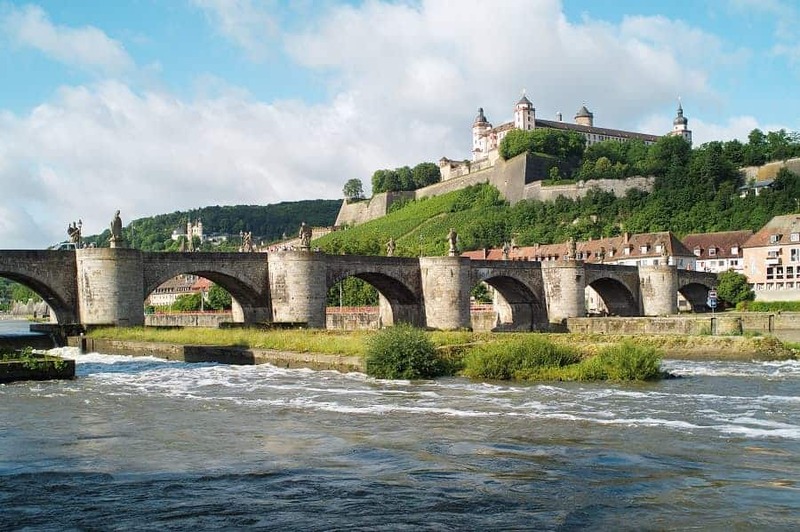 You will also want to take time to see the Alte Mainbrücke Bridge which dates back to 1473, when it replaced a Roman bridge. There are 12 statues of saints that were added around 1730. 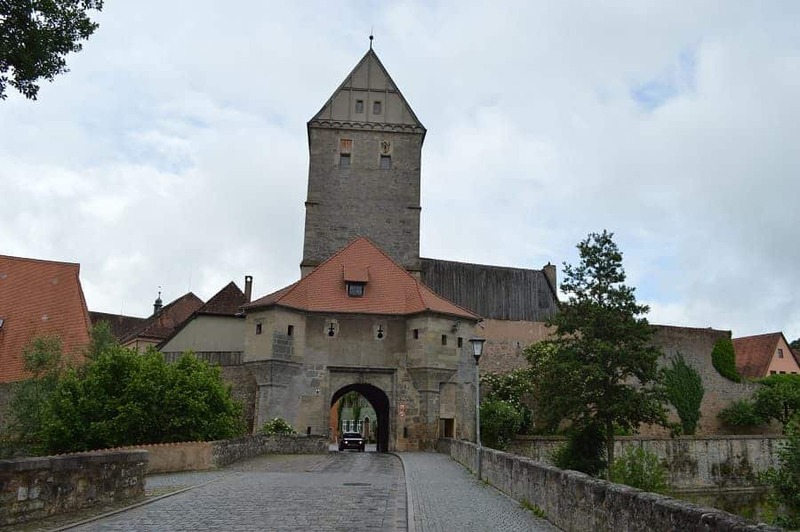 If you loved Dinkelsbühl, Germany, you will really find Rothenburg ob der Tauber just as fascinating. Just a quick 30 minutes to the North you will find another walled city that makes you feel like you’ve stepped back in time. 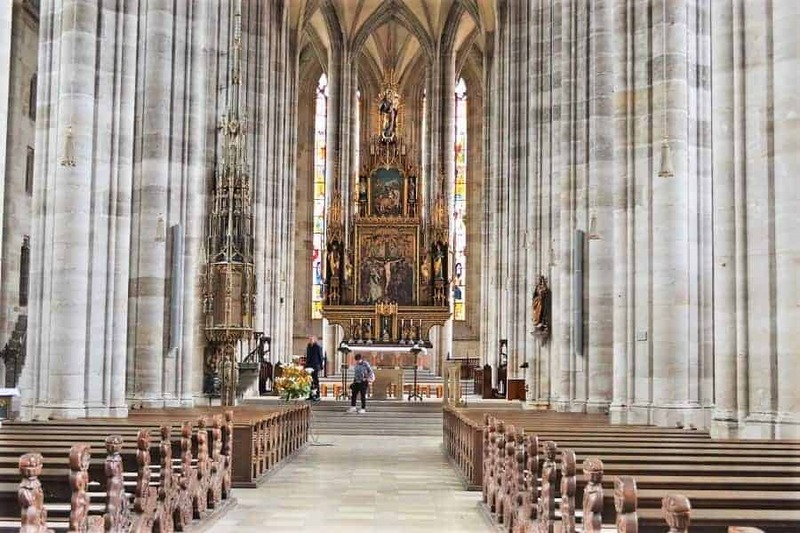 While there is much to see here, two things that it has that you won’t find anywhere else in Germany are the Medieval Crime & Justice Museum and the German Christmas Museum. You can easily fit in both during a day trip from Dinkelsbühl. Ever wonder how criminals were punished in the middle ages? It could be down right gruesome! The Medieval Crime & Justice Museum houses ancient tools of punishment for everything from murder to gossiping too much! 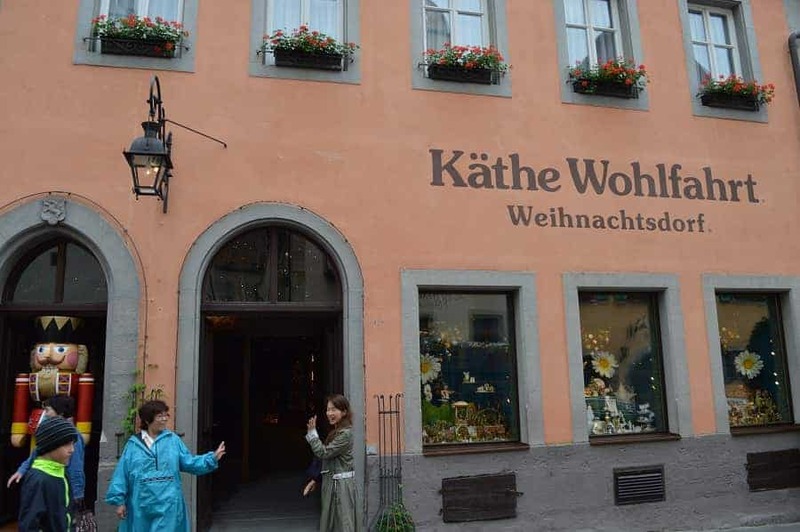 Käthe Wohlfahrt is known for the beautiful selection of Christmas decorations featuring everything from glass to traditional German wooden ornaments. The store is ENORMOUS and the top floor has the German Christmas Museum filled with unusual and rare Christmas decorations from the 19th and the early 20th centuries. Driving 2 hours South of Dinkelsbühl will find you at Neuschwanstein, the fairytale castle of King Ludwig and the inspiration for Cinderella Castle in Disney World. You simply cannot go to Bravaria and not see this famous landmark and the fact that you can do it as a day trip from Dinkelsbühl, makes it pretty easy to see! You can see everything BUT the inside of the castle for free. You will be given a guided tour of the interior if you purchase a ticket, but there is no photography permitted inside the castle. While some say that the interior is not worth seeing, I totally disagree. I found it beautiful! 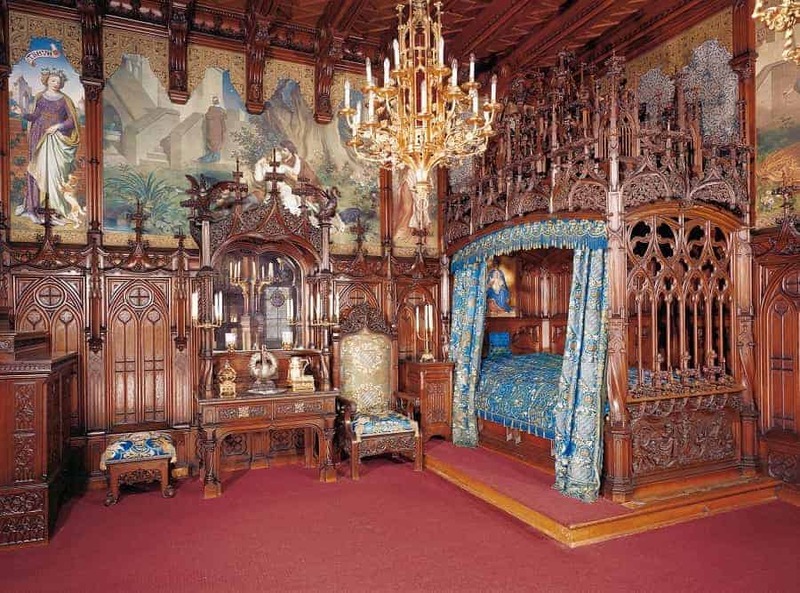 Skip the long queues and book a ticket in advance (€ 13,00) to visit Neuschwanstein Castle. Do yourself a favor and take the bus ride or carriage to the top of the mountain. It doesn’t take you straight to the castle, but it drives you close enough. This ticket is separate and can be purchased the day you arrive. If you choose to walk, it takes about 30-45 minutes, is all uphill, and you have to stop to let the buses pass. The walk isn’t easy unless you are used to such types of walks up a mountain. Taking a few day trips from Dinkelsbühl along the Romantic road is the perfect way to see the storybook villages of Germany! Dinkelsbühl is a wonderful place to make your home base with its rows of colorful gabled buildings, cobblestone streets and 18 medieval watchtowers. From there, you can experience many other important sites in just a few hours time! Have you been to Dinkelsbühl Germany? Did you make any day trips? Great pictures! Looks like a great place to visit! Wow! The pictures are so gorgeous. I would be spending a lot of time in “awe” if I was there. Thanks for sharing your pictures!